Iandslide overview map of the conterminous United States. II. Series: United States Geological Survey. Survey professional paper; 1183. The accompanying landslide overview map of the conterminous United States is one of a series of National Environmental Overview Maps that summarize geologic, hydrogeologic, and topographic data essential to the assessment of national environmental problems. The map delineates areas where large numbers of landslides exist and areas which are susceptible to landsliding. It was prepared by evaluating the geologic map of the United States and classifying the geologic units according to high, medium, or low landslide incidence (number) and high, medium, or low susceptibility to landsliding. Rock types, structures, topography, precipitation, landslide type, and landslide incidence are mentioned for each physical subdivision of the United States. The differences in slope stability between the Colorado Plateau, the Appalachian Highlands, the Coast Ranges of California, and the Southern Rocky Mountains are compared in detail, to illustrate the influence of various natural factors on the types of landsliding that occur in regions having different physical conditions. These four mountainous regions are among the most landslide-prone areas in the United States. The Colorado Plateau is a deformed platform where interbedded sedimentary rocks of varied lithologic properties have been gently warped and deeply eroded. The rocks are extensively fractured. Regional fracture systems, joints associated with individual geologic structures, and joints parallel to topographic surfaces, such as cliff faces, greatly influence slope stability. Detached blocks at the edges of mesas, as well as columns, arched recesses, and many natural arches on the Colorado Plateau, were formed wholly or in part by mass movement. In the Appalachian Highlands, earth flows, debris flows, and debris avalanches predominate in weathered bedrock and colluvium. Damaging debris avalanches result when persistent steady rainfall is followed by a sudden heavy downpour. Landsliding in unweathered bedrock is controlled locally by joint systems similar to those on the Colorado Plateau. In some places, outward gravitational movement of valley walls due to stress release has formed anticlines and caused thrusting in the center of valleys. In the Coast Ranges of California, slopes are steep, and rocks are varied and extensively deformed. One of the most slide-prone terrains of the Coast Ranges is the tectonic melange of the Franciscan assemblage, on which huge masses of debris are moving slowly downslope. In southern California, debris flows generated by soil slips are particularly damaging. Similar flows are common in poorly consolidated Tertiary rocks of the central part of the State. Like the debris avalanches of the Appalachian Highlands, the flows form during intense rainfall after previous steady rain. The Southern Rocky Mountains are complex in rock type and climate, so that the landslides there are also complex. Slides range from rock-falls at one extreme to slumps and debris flows at the other. They include ”sackungen,” which are distinguished by ridgetop grabens associated with uphill-facing scarps on ridge sides, both features of gravitational origin. Extensive regional joint patterns have not been recognized, and shallow soil slips are only a minor hazard. As land development accelerates in the United States and as greater quantities of our natural resources are extracted, it becomes increasingly important to understand the constraints on land use that are imposed by natural physical conditions, and to be aware of the damage to the total environment that may result from ignoring these constraints. A series of National Environmental Overview Maps, including this landslide overview map, has been prepared to summarize particular geologic, hydrologic, and topographic data essential in assessing environmental problems on a national scale. The accompanying map indicates regions where slopestability problems should be considered in large:scale national planning, for example, in evaluating areas suitable for nuclear reactors, solid-waste disposal, large open-pit mining operations, transportation and utility corridors, or major water-development projects. The map shows areas of landslides and areas susceptible to future landsliding in the conterminous United States. The most obvious purpose of the map is to delineate areas where landsliding may pose problems in land use, including possible damage to engineering works. These areas are places where construction or careless land development may damage the environment, not only directly by reactivating existing landslides or activating new ones but also indirectly. For example, if construction activity were to cause landsliding, one effect could be an increased debris load in streams, which would degrade the aquatic habitat and perhaps damage valuable timber by depositing sediment around tree trunks, or destroy spawning grounds for fish. In compiling this map, we considered landslides to be any downward and outward movement of earth materials on a slope. Landslides generally move by the falling, sliding, or flowing of rock and (or) soil, or by a combination of these and other less common types of movement. For a comprehensive discussion of landslide types and processes, the reader is referred to Schuster and Krizek (1978). Talus deposits, formed by falling or rolling of individual rocks, were not considered landslides, unless the deposits were thought to be moving. Other deposits of gravitational origin that we did not consider include: Tertiary megabreccias (deposits resulting from ancient landslides not related to present slopes), large gravitational thrust sheets, solifluction deposits, snow avalanches, and debris deposited by flows that contribute to alluvial fans in arid regions. Some of these deposits may have been included, however, in places where the original data used in compilation did not distinguish these deposits from other kinds of surficial deposits. Individual landslides could not be shown on a map of this scale. The map was prepared by evaluating formations or groups of formations shown on the geologic map of the United States (King and Beikman, 1974) and classifying them as having high, medium, or low landslide incidence (number of landslides) and being of high, medium, or low susceptibility to landsliding. Thus, those map units or parts of units with more than 15 percent of their area involved in landsliding were classified as having high incidence; those with 1.5 to 15 percent of their area involved in landsliding, as having medium incidence; and those with less than 1.5 percent of their area involved, as having low incidence. This classification scheme was modified where particular lithofacies are known to have variable landslide incidence or susceptibility. In continental glaciated areas, additional data were used to identify surficial deposits that are susceptible to slope movement. Susceptibility to landsliding was defined as the probable degree of response of the areal rocks and soils to natural or artificial cutting or loading of slopes or to anomalously high precipitation. High, medium, and low susceptibility are delimited by the same percentages used in classifying the incidence of landsliding. For example, it was estimated that a rock or soil unit characterized by high landslide susceptibility would respond to widespread artificial cutting by some movement in 15 percent or more of the affected area. We did not evaluate the effect of earthquakes on slope stability, although many catastrophic landslides have been generated by ground shaking during earthquakes. Areas susceptible to ground failure under static conditions would probably also be susceptible to failure during earthquakes. Published data were used wherever possible. In many places, the percentage of a formation involved in landsliding, as shown on the large-scale published maps, was determined by counting squares of a superimposed grid. Formations shown on the large-scale maps were then correlated with geologic units on the geologic map of the United States. In some places, notably in Colorado and parts of California and the Appalachians, recent compilations from aerial photographs provided detailed information on landslide incidence (Nilsen and Brabb, 1972; Davies, 1974; Colton and others, 1976). For the Eastern United States, published data and information from aerial photographs, newspaper accounts, and fieldwork were used. For many parts of the country, however, particularly for parts of the Western United States, information on landslides and their relation to geologic conditions is sparse. Data from the relatively small number of geologic maps and reports that give detailed information on slope stability in scattered places, therefore, were extrapolated as accurately as possible into adjacent areas. Extrapolation was aided by unpublished information, by discussions with many geologists who have worked in various parts of the United States, and by the personal knowledge of the compilers. General knowledge of climatic and topographic conditions, such as the extent of desert areas and of alluvial and volcanic plains, and the existence of coastal cliffs, fault scarps, and steep-sided canyons, was applied in extrapolation wherever possible. Where slides formed under special circumstances, such as along steep cliffs, landslide incidence is shown by dots or heavy lines without boundaries. Although both slope angle and precipitation influence slope stability, we could not give full weight to these factors in preparing the map because no slope map or detailed precipitation map exists on a suitable scale for the entire United States. The 8-inch or 10-inch precipitation isolines, taken from ”Climates of the States” (National Oceanic and Atmospheric Administration, 1974), appear on the map (see pl. 1, explanation) because experience in California shows that landslides are generally few where precipitation is less than 8 or 10 inches per year (Cleveland, 1971; Radbruch and Crowther, 1978). In some arid regions, particularly in the Basin and Range Area, landslides may be abundant where precipitation is less than 8 or 10 inches per year, but susceptibility to future natural landsliding is still low. This apparent anomaly is due to the probability that much landsliding in now-arid regions took place during Pleistocene time, when precipitation was heavier than at present. The areas within the 8-inch or 10-inch precipitation isolines may, therefore, have low landslide susceptibility, even though the incidence of landslides may be high locally. Existing landslides in these areas may be reactivated or new landslides generated by construction activity, excessive natural loading, unusual natural or artificial wetting (such as irrigation), or erosion. The susceptibility categories are largely subjective because insufficient data are available for precise determinations. Susceptibility is shown on the map by stippled and line patterns (see pl. 1, explanation). Where source maps show slope movement for one part of a geologic unit but not for others, it is generally unknown whether the absence of recorded landslides indicates a difference in natural conditions or simply a scarcity of information on landslides for parts of the unit. Generally, we assumed that anomalous precipitation or changes in existing conditions can initiate landslide movement in rocks and soils that have numerous landslides in parts of their outcrop areas. For example, the slide-prone Upper Triassic Chinle Formation in the Western United States, which illustrates this particular problem and method of compilation, was assigned high landslide incidence where incidence is known and, where unknown, low incidence but moderate susceptibility. If susceptibility of a rock unit is known to be high though landslide incidence is, low – for instance, where flat areas are underlain by the Upper Cretaceous Pierre Shale or by glacial-lake clay in the Interior Division – the susceptibility may be two categories higher than the incidence. In such areas, landslides may be rare, except along stream channels, but extensive slumping may take place in excavations. Dip slopes, which are susceptible to landsliding when excavated for cuts and foundations, have not been shown as susceptible unless otherwise prone to landsliding. Evaluation of the formations and groups of formations on the geologic map of the United States was made at a scale of 1:2,500,000; the necessary extrapolation was made at the final publication scale of 1:7,500,000. Because some generalization was necessary at the smaller scale, several small areas of high incidence and susceptibility were slightly exaggerated in order to retain them on the map. Very small areas of lower-within higher categories were eliminated, and areal boundaries were simplified. After compilation was complete, several parts of the United States were field checked, both on the ground and from the air, to verify the overall accuracy of the map, particularly in areas where information was sparse. A preliminary version of the map (Radbruch-Hall and others, 1976a) was sent to each State geological survey of the conterminous United States for comments, which we considered in preparing the final map. The assigning of any area to the lowest incidence or susceptibility category should not be construed to mean that no landslides exist or that no areas are susceptible to landsliding. Even areas in the lowest category may contain landslides unknown to the compilers or have an incidence of less than 1.5 percent. In general, the possibility is great that much more landsliding than is indicated exists in any given map area (except for the highest category), owing to the overall scarcity of landslide information for many parts of the country. Moreover, many published special-purpose geologic maps do not show landslides, even where they are known to exist. Because the map is highly generalized, owing to the small scale and the scarcity of precise landslide information for much of the country, it is unsuitable for local planning or actual site selection. However, the compilation showed that certain types of rocks and certain geologic conditions favor landsliding wherever they occur on slopes. Fine-grained clastic rocks – those consisting predominantly of silt and clay-size particles – are most prone to landsliding. They are particularly susceptible if they are poorly consolidated, and (or) are interbedded with or overlain by more resistant but fractured and permeable rocks, such as limestone, sandstone, or basalt. Highly sheared rocks, particularly tectonic melanges, slide extensively. Loose slope accumulations of fine-grained surface debris are susceptible to sliding, particularly at times of intense or sustained rainfall. Areas having any of these conditions should be evaluated for their stability in any regional planning. The authors were assisted by L. W. Anderson, P. E. Carrara, J. A. Holligan, S. V. Lee, E. G. Newton, R. M. Nolting, Gregory Ohlmacher, P. E. Patterson, G. R. Scott, K. C. Shaver, and J. W. Whitney. General areal responsibility among the authors is as follows: Radbruch-Hall – Washington, Oregon, California, New Mexico, and eastern Utah; Colton – Colorado; Davies – area east of the Mississippi River; Lucchitta – Nevada, Arizona, western Utah, and the southwestern part of New Mexico within the Basin and Range Area; Skipp – Idaho; and Varnes – western States between the Mississippi River and the east borders of Washington, Oregon, Idaho, Utah, Colorado, and New Mexico. Inquiries regarding specific parts of the map should be addressed to the respective author. D. H. Radbruch-Hall coordinated the compilation and final assembly of the map and text. The author-compilers are indebted to many persons too numerous to mention, both within and outside the U.S. Geological Survey, for contributions of unpublished data. A map showing landslides in the State of Washington was compiled by the Washington Division of Geology and Natural Resources from data in their files, and used with other data in preparing the map of Washington. Maps of Missouri and Texas compiled under contract to the U.S. Geological Survey by personnel of the Missouri Geological Survey and the Texas Bureau of Economic Geology, respectively, were used with some modification in the compilation. The personnel of many State geologic organizations reviewed the preliminary map (Radbruch-Hall and others, 1976a) and made constructive suggestions for its improvement. Geologic factors that affect slope stability also influence the form of the land surface. It is appropriate, therefore, to evaluate slope stability in terms of its physiographic setting. The physiographic regions of the United States in the following synopsis are modified from the physical subdivisions in ”The National Atlas of the United States of America” (Hammond, 1965) (see pl. 1). Divisions generally are discussed below in order of their position from west to east, and subdivisions from west to east or north to south. Rock types, structure, topography, precipitation, landslide type, and landslide incidence are mentioned in the description of each physical subdivision because these factors are the major determinants of slope stability. Steep slopes heighten the susceptibility to landsliding, so that many mountainous areas of the United States are slide prone, although steep slopes alone do not determine susceptibility. For a slope to fail, the driving forces that cause failure must exceed the resisting forces that maintain stability. Steep slopes in hard, unfractured, homogeneous rocks may be very stable. Slopes currently being steepened or undercut – for example, along active faults, wave-cut cliffs, or vigorously eroding streams – may be very unstable, particularly in soft rocks. The Coast Ranges, which border the entire west coast of the United States from the Olympic Peninsula south to Mexico, vary greatly in both rock type and climate. Upper Mesozoic and Tertiary sedimentary rocks predominate, although intrusive and metamorphic rocks are also present. Most rocks have been folded, faulted, and in places intensely sheared; many of the Tertiary rocks are poorly consolidated. Topography is mountainous, with steep slopes and intervening flat valleys. Precipitation in the Coast Ranges is seasonal, ranging from very wet in parts of the northern ranges to semiarid in the south, with periodic storms accompanied by intense rainfall (for precipitation terminology see Wilson, 1967). The combination of steep slopes, soft, sheared rocks, and periods of heavy precipitation makes this subdivision, particularly in California, one of the most landslide prone areas of the United States. Tectonic melange, especially that of the Franciscan assemblage, is especially slide prone; landslides on natural slopes are common in all three categories of slide, fall, and flow. Debris flows during rainstorms are a particular hazard in southern California, where much of the area is heavily developed, so that many landslides have been artificially activated. The Coast Ranges are seismically active, and earthquakes have triggered many landslides. The Puget-Willamette Lowlands extend from the United States-Canadian border south to Eugene, Oreg., between the Coast Ranges and the Cascade Mountains. The climate is subhumid to humid. The southern part of the lowlands consists of alluvial valleys along the Cowlitz, Columbia, and Willamette Rivers. The northern part is a flat glacial plain interrupted by the complex bays and inlets of Puget Sound. Landslides are numerous along the wave-cut cliffs, particularly where the cliffs expose glacial drift overlying clay; elsewhere, landslides are few, except in Eocene sedimentary rocks at the south end of Puget Sound. The Central Valley of California is a long, flat northwest-trending plain between the Coast Ranges on the west and the Sierra Nevada on the east. Climate is subhumid in the north and arid in the south. The valley is underlain primarily by Holocene alluvium, although some Tertiary sedimentary rocks are exposed at its edges along the fronts of the surrounding mountains. Landslides are few. The Cascade-Klamath-Sierra Nevada Ranges are quite different from one another in rock type, topography, climate, and landslide characteristics. The Cascade Range, to the north, is primarily volcanic and is characterized along its length by large, recently active volcanoes. The climate is subhumid to very wet. Mudflows have accompanied volcanic eruptions, and the steep slopes of the volcanoes are presently subject to mudflows, rock falls, and snow and rock avalanches. Some older Tertiary volcanic and clastic rocks on the flanks of the Cascade Range, particularly on the west side, are prone to landsliding, but landsliding is minor in the rest of the subdivision. The Klamath Mountains, bounded by the Coast Ranges on the west and the Cascade Range on the east, contain a variety of rocks that include serpentinite, granitic and metamorphic rocks, and Paleozoic and Mesozoic sedimentary rocks. Topography is steep, and climate is humid. Many of the rocks are jointed, foliated, and faulted. Landslides, particularly debris slides and flows, are common, especially in highly sheared serpentinite. The Sierra Nevada has a steep east-facing front that rises from an elevation of 2,100 m or less at its foot to more than 4,200 m at its crest. The range slopes gently west to the Great Valley, but many of its west-draining canyons are deep and steep sided. Climate ranges from humid along the north crest to arid at the south and along the east front. The core of the range is a complex granitic batholith surrounded by various Palezoic sedimentary rocks, Mesozoic sedimentary and metavolcanic rocks, and Tertiary volcanic suites. In general, landslides are uncommon, although rock falls occasionally drop from the high peaks, and mudflows run off the easily eroded Tertiary volcaniclastic flows and breccias. Large landslides are abundant in Tertiary rocks on the steep northwest side of the Tehachapi Mountains, a horst at the south end of the Sierra Nevada. The Columbia Basin subdivision of northern Oregon and southeastern Washington is underlain primarily by Tertiary volcanic rocks that in general are not prone to landsliding. Topography is predominantly flat, but is sharply dissected locally. The climate is arid to semiarid. Some large landslides have formed along steep cliffs of the Columbia River Basalt Group that line the Columbia River and its tributaries. Slide planes are generally in interbedded tuff or fine-grained sedimentary rocks that are rendered even more susceptible to sliding by local upwarping and folding. Landslides also take place where Pleistocene sand and silt filling valleys in the basalt are cut by the Columbia River and its tributaries. Similar sliding is prevalent along Lake Roosevelt in northern Washington, where Pleistocene deposits fill valleys cut into Paleozoic and Mesozoic igneous and metamorphic rocks (Jones and others, 1961). Although the Harney-Owyhee Broken Lands resemble the Basin and Range Area in climate and structure and are included in it by some authorities, fault-block ranges are less pronounced in the Broken Lands than in the Basin and Range Area. The rocks are predominantly volcanic, and landsliding is minor. Some landslides exist locally where sedimentary rocks are interbedded with or overlain by basalt, along steep fault scarps, or along bluffs of tuffaceous Pliocene volcanic rocks. The Snake River Plain in southern Idaho is an arid to semiarid plain that separates the Rocky Mountains of central Idaho from the Basin and Range Area of the southern part of the State. Flat-lying Quaternary basalt, some only 2,000 years old, and thick loess deposits underlie the major part of the desert in the eastern plain, where landslides are almost unknown. A few landslides have formed along the canyons of the Snake River and its tributaries, where downcutting has activated sliding in the tuffaceous sedimentary rocks of Tertiary and Quaternary age and slumping in the interbedded basalt. Slides of this type have occurred along the bluffs of Salmon Falls Creek west of Buhl, Idaho (Malde and others, 1968), in the last four decades. Some landslides exist and more can be expected in the tuffaceous facies of the rhyolitic Tertiary volcanic rocks that form the south border of the Snake River Plain. The Basin and Range Area comprises most of the State of Nevada and parts of Oregon, Idaho, California, Utah, Arizona, New Mexico, and Texas. The province is characterized geologically by tilted fault blocks whose crests form linear ranges separated by deep structural basins generally filled with poorly consolidated sedimentary rocks. Many summits exceed 8,400 m, and some 8,700 m; the highest peak is White Mountain in California, elevation 8,788 m.
Climate in most of the Basin and Range Area is semiarid to arid. Extensive areas, particularly the basins, receive 8 inches or less of precipitation per year. Some precipitation occurs as cloudbursts of high intensity and short duration, so that runoff is heavy and infiltration is minimal. These conditions favor debris flows, particularly those that contribute to alluvial fans, rather than slides. Thus, debris flows are the rule and slides are the great exception among current slope movements in the Basin and Range Area. The slides tend to be concentrated in the more northerly latitudes or at the higher elevations, where annual precipitation is greater than in the rest of the Basin and Range Area. Many slides date back to the Pleistocene, when conditions were wetter. Minor recent sliding occurs along the edges of fault-bounded basins. Volcanic sediment, especially air-fall tuffs, and shale are the rocks most commonly involved in landsliding in the Basin and Range Area. These rock types rarely produce landslides in the absence of a resistant cap rock because erosion quickly reduces slopes to very low angles. Cap rocks typically are welded tuffs, mafic lava flows, and resistant sedimentary rocks, such as quartzite and massive carbonates. Sheared and fractured massive carbonates and crystalline rocks are also prone to sliding. The resistance of these rocks to weathering causes steep slopes, and the presence of shear planes leads to mechanical failure. Because of the general scarcity of landslides in the Basin and Range Area, any location for which landslides are reported is an anomaly. Therefore, landslides that exist in numbers below the cutoff level established for this map are marked by symbolic dots. These slides would not be singled out in other parts of the country where landslides are more common. A few exceptionally large and well-known landslides, including the Tin Mountain landslide west of Death Valley (Burchfield, 1966) and the Blackhawk landslide on the north side of the San Bernardino Mountains (Shreve, 1968), both in California, lie in this subdivision. They are numbered on the map. The Colorado Plateau comprises the colorful subhumid to arid uplands of Utah, Colorado, Arizona, and New Mexico, which include the scenic Grand Canyon, Monument Valley, Bryce and Zion National Parks, and Canyon de Chelly. Rocks range from Precambrian crystalline rocks, notably in the Grand Canyon, through Paleozoic and Mesozoic sedimentary rocks, to Tertiary and Quaternary sedimentary, volcanic, and intrusive rocks. Much of the plateau consists of interbedded shale and massive sandstone of Mesozoic age. The rocks are nearly horizontal over wide areas, but in places have been deformed into monoclines, broad folds, warps, and domes intruded locally by igneous rocks and cut by numerous faults. The Colorado Plateau is largely above 1,500 m in elevation; some parts are above 8,400 m, and some summits exceed 8,700 m. The plateau is incised by many very deep, steep-walled canyons. Rock fall, slumps, complex block slides, and debris flows are numerous; spalls and rock falls are common in canyon walls. Landslides are abundant: (1) in soft shale of the Triassic Chinle Formation, especially where it is overlain by the Triassic Wingate Sandstone or by volcanic flows; (2) in the shale and mudstone of the Jurassic Morrison Formation, especially where they are overlain by the Cretaceous Dakota Sandstone; and (8) in the Cretaceous Tropic and Mancos Shales, especially where overlain by the Straight Cliffs Sandstone or by sandstone of the Mesaverde Formation. Landslides also occur in other interbedded shales and sandstones. Many flat-topped plateaus and mesas, where resistant rocks cap weaker ones, are rimmed by large landslide blocks. This characteristic feature of the Colorado Plateau is indicated on the map by the distinctive pattern of heavy lines indicating high incidence. Two exceptionally large landslides on the Colorado Plateau deserve special mention: the prehistoric landslide in Zion Canyon that dammed the Virgin River, and the Needles in southeastern Utah. The landslide in Zion Canyon involved the Chinle Formation and the overlying Wingate Sandstone, Kayenta Formation, Navajo Sandstone, and Carmel Formation (Grater, 1945). The Needles consists of a system of faults and grabens apparently formed when salt and gypsum flowed laterally from under the Needles area toward the canyon of the Colorado River as the load on the salt and gypsum was decreased by downcutting of the canyon (Lewis and Campbell, 1965). Lateral movement of material toward the canyon formed the Meander anticline along the axis of the river (fig. 1). Concurrent spreading of overlying rocks east of the canyon formed the grabens and trenches, which have a typical arcuate landslide pattern concave toward the canyon. The generally east-west to northwest trending Upper Gila Mountains of Arizona and New Mexico lie between the Colorado Plateau on the north and the Basin and Range Area on the south; some authorities include these mountains in the Basin and Range Area. Their climate is mainly semiarid. The Upper Gila Mountains consist largely of Precambrian sedimentary, metasedimentary, and granitic rocks, and Tertiary volcanic rocks of various kinds. There are few landslides in the subdivision. The Northern Rocky Mountains subdivision, which makes up most of northern Idaho and western Montana, consists of numerous ranges with peaks rising to over 3,400 m, separated in places by elongate valleys filled with Tertiary or Quaternary continental sedimentary rocks. The ranges consist of folded and faulted Precambrian, Paleozoic, and Mesozoic sedimentary rocks; large masses of Tertiary volcanic rocks; cetaceous and Tertiary plutonic rocks; and metamorphic rocks. The climate ranges from semi-arid along the border of the Snake River Plain to humid (alpine) in ranges to the north. In Idaho, debris slides and flows are abundant in some travertine deposits and lakebeds of Miocene age and in the tuffaceous facies of the tertiary Challis Volcanics. Most of the rest of the Challis contains a moderate number of landslides. Historic mudflows in argillized rocks of the Challis took place in the Thunder Mountain area (Leonard, 1973). Smaller landslide areas are in welded tuffs that overlie soft. Cretaceous shale of the Centennial Range and in glacial deposits that overlie the Idaho batholith. The Squaw Creek Schist also contains landslide areas west of the batholite Slumps and debris avalanches are extensive in the border-zone rocks of the Idaho batholith. These rocks have a high mica and (or) clay content and, where highly weathered and fractured, are easily destabilized by heavy rain or snow. The batholith is relatively free of landslides, although colluvium along the South Fork of the Salmon River has slumped in several places, and a few areas of grus may be unstable. Small rock falls in the granodiorite of Sawtooth National Forest are minor hazards. Figure 1. - Meander anticline in the canyon of the Colorado River, southeastern Utah, Arcuate grabens of Needles are visible on right. Width of the river is approximately 150m. In south-central Idaho north of the Snake River Plain, landslides are locally concentrated in shale and shaly limestone interbedded with massive upper Paleozoic limestone. Argillite of the Precambrian Prichard Formation forms an area of potential sliding along the Mojie River in northern Idaho, and a moderate amount of Holocene landsliding has taken place in metamorphosed rocks of the Precambrian Belt Supergroup in Clearwater National Forest (Day and Megahan, 1975). Landslide scars and mudflows are plentiful at higher altitudes in the Belt of the Lemhi Pass area (Sharp and Cavender, 1962) and in lacustrine and fluvial deposits of the intermontane basins of the Idaho-Montana border area. In southwestern Montana, Tertiary volcanic rocks contain a moderate number of slumps, as do shaly Paleozoic and Mesozoic rocks in the disturbed belt along the east border of the mountains. Landslides are prevalent on slopes where the Upper Cretaceous Judith River Formation (Waldrop and Hyden, 1968) or the Lower Cretaceous Mowry and Thermopolis Shales underlie Tertiary volcanic rocks. In western Montana, slides in quartzite and argillite of the Belt Supergroup have blocked highways – for example, south of Glacier Park, between Anaconda and Phillipsburg, Mont., and between Missoula and Drummond, Mont. Thrust faults have moved massive Paleozoic limestone over Cretaceous shale in the disturbed belt west and northwest of Great Falls, Mont. High cliffs of limestone exposed at the mountain front are unstable, and the bases of the cliff are lined with deposits resulting from rock fall-debris flows (Mudge, 1965). Large and rapid slope failures in fractured rock are significant hazards in the northern Rocky Mountains of the United States and Canada. The Madison landslide, which was triggered by the Hebgen Lake earthquake in 1959, took at least 20 lives in the valley of the Madison River west of Yellowstone National Park (Hadley, 1964). The Northern Rocky Mountains extend slightly into northern Washington. Landslides are mainly slump-earth flows in fine-grained terrace material of glaciofluvial and glaciolacustrine origin in the valley of the Columbia River (Jones and others, 1961). The Blue Mountains of northeastern Oregon are bordered on the north by the Columbia Basin, on the south by the Harney-Owyhee Broken Lands, and on the east by the Northern Rocky Mountains. The climate is subhumid to semiarid. The Blue Mountains were arched upward and faulted since Miocene time; subsequent rapid erosion has cut steep gorges that are separated by sharp ridges or tablelands. The area is underlain predominantly by Tertiary sedimentary and volcanic rocks, with lesser amounts of Mesozoic sedimentary rocks. Landslide incidence and susceptibility are very high in the interbedded rhyolite flows, tuffs, and tuffaceous sedimentary rocks of the Tertiary John Day Formation in the western Blue Mountains, and landslides are prominent but somewhat less abundant in the Tertiary Clarno Formation. Landslides are few in other parts of the subdivision. The Wyoming-Big Horn Basins subdivision includes extensive areas of low relief, some smaller mountain ranges, and hilly areas between ranges of the Middle Rocky Mountains. The low relief and aridity have led to a low incidence of landsliding, but the rocks themselves are susceptible to local failure. Some landsliding takes place on the west flank of the Powder River Basin in northern Wyoming; in Cretaceous and Oligocene deposits on the flanks of some ranges in central Wyoming; and in southern Wyoming and northwestern Colorado, where Tertiary lakebeds and other continental deposits of the Green River and Wasatch Formations have been involved in considerable sliding and flowage. The Middle Rocky Mountains, which extend north and northeast from southern and central Utah into northwestern Colorado, southwestern Idaho, northwestern Wyoming, and southern Montana, include: (1) the Absaroka, Owl Creek, Wind River, Bighorn, and Teton Ranges, and the ranges to the south of the Tetons along the Idaho-Wyoming border; (2) the Beartooth Mountains in Montana; (8) the Wasatch Range, extending from Idaho into southern Utah; and (4) the east-west Uinta Mountains in northeastern Utah and north-western Colorado. In Utah and southern Idaho, the mountains are bounded on the west by the steep west-facing scarp of the active Wasatch fault. Some of the ranges have peaks more than 4,000 m high; the topography is rugged to rolling, and local relief is commonly more than 1,500 m. The climate ranges from semiarid to humid. At least half of the part of this subdivision that lies in Wyoming, southeastern Idaho, and Colorado is underlain by rocks that are either moderately to highly susceptible to slope failure or have moderate to high landslide incidence. Rocks of many types are involved, ranging in age from Precambrian through Quaternary. In southeastern Idaho and southwestern Wyoming, shale of the Lower Cretaceous Bear River Formation and the Gannett Group are landslide prone. Several upper Paleozoic lower Mesozoic sedimentary formations, including the Amsden, Phosphoria, Ankareh, and Stump Formations, also are moderately unstable. The interbedded sandstone, mudstone, shale, and limestone of the Tertiary Wasatch Formation have many slumps and debris flows. Paleocene welded tuffs that overlie softer Cretaceous rocks are susceptible to slumping where dissected, as along the Snake river adjacent to the Snake River Plain on the south. In northwestern Wyoming, soft bentonitic claystone and shale of Jurassic and Cretaceous age are particularly susceptible to slump-earth flows and debris flows (Bailey, 1971; Love, 1978). Shale, siltstone, and sandstone of early Tertiary age also slide, especially where overlain by massive volcanic rocks (Pierce, 1968). Colluvium and glacial detritus on slopes in the higher mountains, such as the Teton and Wind River Ranges, can be mobilized by melt water and torrential rains to form slides and debris flows. Shale of the Cambrian Gros Ventre Formation and the Gallatin Formation underlying the massive Ordovician Bighorn Dolomite and the Mississippian Madison Limestone slide in parts of southern Montana and northcentral Wyoming (Holland and Everitt, 1974). Large landslides in these rocks along the Bighorn River have been reactivated by the creation of the Bighorn Reservoir (Dupree and Taucher, 1974). Other slide-prone combinations in the Middle Rocky Mountains in Wyoming and Colorado consist of sandstone of the Cretaceous Lakota Formation overlying shale of the Jurassic Morrison Formation, as well as Tertiary sandstone, conglomerate, and volcanic rocks overlying shales of the Cretaceous Niobrara and Frontier Formations. Figure 2. - Rockfall, slump, and earth-flow deposits beneath cliffs of basalt overlying weak Tertiary rocks, northwest end of Grand Mesa, western Colorado (photograph by R. B. Colton). Scale indicated by trees on debris below cliff. Shale overlain by massive rocks is particularly unstable where the rocks dip toward a valley and the massive rocks have been cut free by erosion. The lower Gros Ventre slide south of Teton National Park is a well known example in which the Tensleep Sandstone slid down over the underlying shaly Amsden Formation (Keefer and Love, 1956; Voight, 1978). 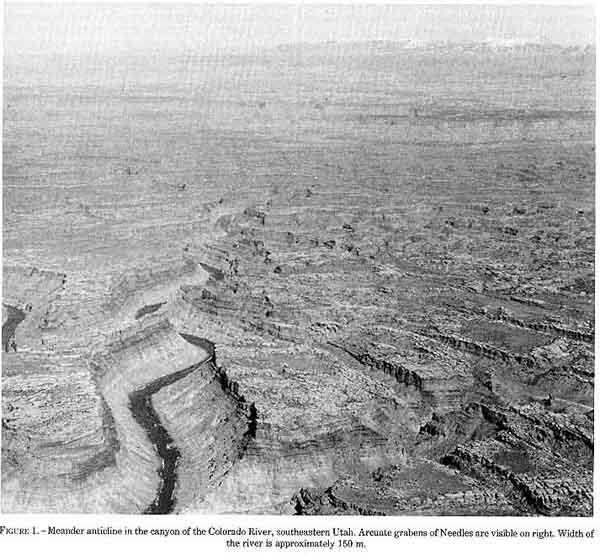 Around the edges of mesas where a massive unit, such as sandstone or volcanic rock, overlies a soft unit, such as shale, slumps and falls are similar to those on the Colorado Plateau (Yeend, 1978) (fig. 2). In Utah, landslides in both rock and soil are numerous along the Wasatch Front (Mead, 1972; Pashley and Wiggins, 1972; Van Horn and others, 1972) and on both flanks of the Uinta Mountains, especially where quartzitic Precambrian rocks have been thrust over the Cretaceous Hilliard Shale and other soft rocks (Hansen, 1965). Other bad actors include the Lodore Formation (Cambrian), the Doughnut Formation (Mississippian), the Morgan Formation (Pennsylvanian), and the Morrison Formation (Jurassic). A very large example of lateral spreading in Pleistocene Lake Bonneville deposits was described by Van Horn (1975). The High Plateaus of central Utah are included here in the Middle Rocky Mountains although most authorities place them on the Colorado Plateau. The plateaus all exceed 2,700 m in altitude, and some 8,400 m, including peaks more than 8,700 m high; many plateaus are capped by basalt. Rock slides from steep cliffs are common, as well as slumps and flows where beds of soft rocks are interbedded with or overlain by more resistant rocks. The Cretaceous Tropic Shale, the Cretaceous and Paleocene North Horn Formation, the Tertiary Flagstaff Limestone, and the Tertiary Bullion Canyon Volcanics are particularly susceptible to landsliding (Shroder, 1971). The central core of the Black Hills dome consists of stable metamorphic and igneous rocks of Precambrian age, but parts of the surrounding belt of tilted sedimentary rocks are unstable, notably where shale or claystone of the Jurassic Sundance and Morrison Formations are overlain by thick sandstone beds of the Sundance Formation or the Lower Cretaceous Inyan Kara Group (Robinson and others, 1964; Cattermole, 1972). The Southern Rocky Mountains subdivision includes the Medicine Bow and Laramie Ranges of southern Wyoming, the numerous ranges of central and southwestern Colorado, and the mountainous regions of northern New Mexico. The subdivision is a region of complex geologic history and structure and of greatly varying lithology. Topography ranges from rugged high peaks to extensive, fairly level but high intermontane basins. Nearly the full range of slope-failure processes has been or is now active within the region. Landslide susceptibility and incidence may appear more extensive for Colorado than for some other States, as shown on plate 1, because large-scale maps showing the actual distribution of landslide and related deposits have been prepared for Colorado from interpretation of all available geologic maps and aerial photographs (Colton and others, 1976). (See text on reverse of plate 1 for a reproduction of the landslide map of Colorado at a scale of 1:7,500,000.) These landslide maps have confirmed the general impression that landslide deposits are rarely shown in their full extent on geologic maps prepared for other purposes, even recent maps at large scales. In most areas of moderate to high landslide incidence, the slope failures occurred during some previous time of wetter climate, possibly during waning glaciation. Although now inactive, such areas are easily reactivated by alterations of the slope or ground-water conditions. Slope failures are most abundant in areas underlain by Cretaceous shale (Varnes, 1949; Rogers and Rold, 1972); by Tertiary continental deposits, such as the Green River and Wasatch Formations; or by Tertiary volcanic sequences, particularly those that are hydrothermally altered or that include weak, permeable beds of agglomerate (Howe, 1909; Crandell and Varnes, 1961), and those comprising massive volcanic rocks underlain by siltstone and shale. Rocks of all lithologies and ages are affected by slope movement to some degree. Cliffs and canyon walls of Precambrian igneous and metamorphic rocks are subject to small rockslides and rockfalls, as are steep slopes of Paleozoic and Mesozoic carbonate rocks and sandstone, particularly where underlain by shale. Alpine debris flows generated in talus, colluvium, and weathered bedrock by heavy rainfall or snowmelt occur commonly on steep slopes (Curry, 1966; Rogers and Rold, 1972). The Broken Lands include most of central and eastern Montana, North and South Dakotas west of the Missouri River (except the Black Hills), and eastern Wyoming; all of the subdivision is tributary to the Missouri River. This semiarid region has a typical continental-interior climate with hot summers and cold winters. Much of the Broken Lands is underlain by flat-lying Cretaceous and Paleocene shale, siltstone, and sandstone. The clay-mineral content of many of these rocks is high, so that they are susceptible to slumps and earth flows. The weak and erodible rocks have generally low to moderate relief, with some buttes and badlands; slopes are generally moderate to steep only along drainage courses. For this reason, the areas of moderate and high incidence of landslides are confined mostly to the valley walls of the Missouri River and to its principal tributaries, although the intervening flatter areas show abundant signs of very shallow disturbance of soil and weathered bedrock and are susceptible to landsliding when slopes are steepened by man or nature. Geologic formations known to be very susceptible to landslides are the Pierre, Bearpaw, and Claggett Shales of the Upper Cretaceous Montana Group; the Upper Cretaceous Marias River and Cody Shales; and the Paleocene Fort Union Formation (Crandell, 1952; Fleming and others, 1970; Erskine, 1978; Scully, 1978). Pleistocene glacial-lake deposits along the Missouri River, especially near Great Falls, Mont., are moderately to highly susceptible to slope failure (Lemke and Maughan, 1977). Sliding is common around the perimeters of buttes in southwestern North Dakota and northwestern South Dakota where the Oligocene Chadron Formation overlies the Paleocene Fort Union Formation. This subdivision of low relief is underlain nearly everywhere by flat to gently dipping upper Tertiary continental deposits. The Sand Hills are underlain by Quaternary sand. Small slope failures may occur along stream valleys, but landslides are rare. The Rocky Mountain Piedmont extends through eastern Colorado and New Mexico, from Wyoming in the north to Texas in the south, between the Southern Rocky Mountains and the High Plains in the north and between the Basin and Range Area and the High Plains in the south. This area of generally low relief, which slopes gently east away from the Southern Rocky Mountains, is interrupted by some steep-sided valleys, dissected plateaus, and low mesas. The climate is semiarid. The principal bedrock is Upper Cretaceous shale and sandstone, some parts of which are susceptible to sliding, particularly along hogbacks at the foot of the Front Range in Colorado (Braddock and Eicher, 1962). Permian and Cretaceous rocks are involved in slumps and earth flows along the Purgatoire River in southeastern Colorado, and Tertiary volcanic rocks have failed around the edges of mesas southeast of Trinidad, Colo. In the northeast corner of New Mexico, landslides are abundant in shales of the Triassic Dockum Group and the overlying Jurassic Entrada Sandstone. Large areas of the Dockum Group in east-central New Mexico may be susceptible to landsliding. Landslides are uncommon in this physiographic subdivision because of low relief. Much of the surface is covered either with Pleistocene glacial moraine or lakebeds. There are some landslides and areas susceptible to landsliding in northern North Dakota where glacial till and drift overlie the Paleocene Fort Union Formation (Lemke, 1960). Glacial deposits mask most of the bedrock in this subdivision except along Lake Superior and the northern part of Lake Michigan, where Cambrian sandstone or Ordovician and Silurian limestone form cliffs along the shores of the lakes. Rockfalls are common in these areas. Pleistocene lacustrine clay along the lakeshores and inland in Wisconsin and on Michigan’s Northern Peninsula are highly susceptible to earth flows (Booy, 1977) and lateral spreading, although the incidence is generally low. Small and isolated slides occur primarily in excavations. Slumps and earth flows take place in sedimentary deposits of glacial Lake Nipissing at the west end of Lake Superior. Minor slides have been reported in terraces along the Red River Valley of Wisconsin, the Ontonagon River, and tributaries to the Pine River on Michigan’s Northern Peninsula. Lakeshore bluffs in glacial deposits are moderately susceptible to slumps owing to undercutting by waves. Most bluffs of the Grand Marais sand dunes area along the south shore of Lake Superior and along the east and south sides of Lake Michigan are moderately susceptible to sand flows. Glacial deposits are thin, and lower Paleozoic rocks crop out extensively. The subdivision is free of landslides, except along the limestone and sandstone bluffs on the east side of the Mississippi River, where incidence of rock falls is moderate and susceptibility is high. This region of the interior plains is rolling and dissected; glacial deposits are thin, except in valleys. The subdivision is underlain by Ordovician through Pennsylvanian sedimentary rocks. West of the Mississippi River the province is bounded on the northeast and north by an escarpment of Silurian rocks facing northeast toward the Mississippi. Along this escarpment, both in Iowa and in northeastern Missouri, blocks of the Silurian Edgewood Dolomite have slumped onto the underlying Ordovician Maquoketa Shale, which becomes plastic when wet. In central Iowa, some Des Moinesian shale is moderately susceptible to landslides, particularly where weathered and overlain by loess or till, but not much sliding has occurred. Slumps and debris flows are common in colluvial soil derived from deeply weathered shale of the Kope Formation (Ordovician) along the Ohio River in and around Cincinnati. Most major stream valleys in Ohio are areas of low incidence and high susceptibility, but precise data on landslide incidence is sparse. In north-central Ohio, in the vicinity of Cleveland, block slides and slumps occur along numerous valley walls in Devonian shale and sandstone. Glacial-lake clay throughout the subdivision generally has low relief, but slope failures occasionally occur in excavations. In the Cuyahoga Valley south of Cleveland, Ohio, lacustrine clay and silt are highly susceptible to earth flows, and because of extensive construction in the valley, the incidence of slides is high. Weathered claystone beds in cyclothems (coal-shale-sandstone sequences) of Pennsylvanian age along the Illinois River are highly susceptible to earth flows and slumps. Increased development in recent years has caused a moderate amount of sliding. Along the east side of the Mississippi Valley is a thick deposit of loess that, along with underlying limestone, sand, and clay, is highly susceptible to earth flow and lateral spreading. Incidence of landslides is moderate south of the Ohio River and low to the north. Small areas of lateral spreading and earth flow characterize the Pleistocene marine clay in the upper Saint Lawrence and Champlain River Valleys and the lacustrine clay along Lakes Ontario and Erie. Wave undercutting of the lakeshore bluffs has caused a moderate number of slumps and earth flows. The gorge of the Niagara river below Niagara Falls contains numerous massive rockfalls in thick limestone of Silurian age, which is underlain by weak shale. The broad, relatively undissected flats of this subdivision are covered by thick glacial deposits. Most of the region has only sparse landslides, except near Chicago, Ill., where there are many small areas of lateral spreading and earth flows in lacustrine clay. Similar geologic conditions, but with low incidence, exist inland in the moderately susceptible silt and clay deposits of glacial lakes. Most slope failures in the glacial-lake deposits are in excavations. Bluffs along Lakes Huron and Erie are moderately susceptible to undercutting by wave action and have a moderate number of earth flows and slumps. These areas of low to moderate relief are underlain by a variety of Paleozoic and Mesozoic sedimentary rocks which generally lie flat or are only locally disturbed. Large areas in the north between the Missouri and Mississippi Rivers are blanketed by Pleistocene loess and glacial drift. Particularly susceptible to slumps and earth flows are: loess along major river valleys and their tributaries, clayey till on slopes underlain by shale, the Graneros and Kiowa Shales of Cretaceous age in Kansas, and some Pennsylvanian shale units in southwestern Iowa, northwestern Missouri, and eastern Oklahoma. The Ozark-Ouachita Highlands, which extend southwest from south-central Missouri through northwestern Arkansas into southeastern Oklahoma, are separated from the Eastern Interior Uplands and Basins and the Appalachian Highlands by large lowlands of the Mississippi River Valley and coastal plains. From northeast to southwest, the subdivision consists of: (1) the Ozark Plateaus, including the Saint Francis Mountains of southeastern Missouri and the Boston Mountains of northwestern Arkansas; (2) the Arkansas Valley; and (8) the Ouachita Mountains of western Arkansas and southeastern Oklahoma. Carbonate rocks predominate on the broad, domal Ozark Plateaus, some igneous rocks crop out in the Saint Francis Mountains, and faulted and folded Pennsylvanian sandstone and shale make up much of the Boston Mountains. Landslides are uncommon in the Ozark Plateaus, although a large rockfall occurred in 1971 in the carbonate rocks exposed along the Gasconade River (Missouri Mineral News, 1972). Some sliding has occurred in lower Paleozoic interbedded shale and limestone in the dissected area near the Mississippi River. In the Boston Mountains, the most susceptible unit appears to be the Mississippian Fayetteville Shale. Around the border of the Arkansas Valley and in the Ouachita Mountains, the more susceptible units are Pennsylvanian shales, such as those in the Savanna Formation and the Johns Valley Shale. Along the west edge of the Appalachian Plateau is an area of low, dissected plateaus and plains underlain by flat-lying shale, sandstone, and limestone of Devonian and Mississippian age. The shale weathers deeply, and colluvium accumulates in small tributary valleys. The colluvium in Kentucky and Tennessee is moderately susceptible to sliding when overloaded by fill. Along the Ohio River from Ashland, Ky., to the west side of Cincinnati, Ohio, slumps and debris avalanches are numerous in flat-lying shale-sandstone and shale-limestone sequences of Ordovician, Devonian, and Mississippian age. The most extensive area of slope failure in the Eastern United States is on the plateau of the western Appalachian Highlands. A few slumps form in fresh bedrock, but shallow earth flows in soil and weathered rock are more common. More than 75 percent of slopes in the area from Pittsburgh, Pa., to Chattanooga, Tenn., show signs of failure. In Tennessee and Kentucky, landslides are common in colluvial soil as thick as 20 m along the valley walls of the plateau. Stress release along valley walls has accentuated slope failures along the Ohio, Allegheny, Monongahela, and other rivers in the plateau area. Southeast of the Appalachian Plateau, the flanks of the Appalachian Ridges and the Blue Ridge are covered by extensive colluvium that is highly susceptible to sliding. Because the colluvium covers many types of bedrock, the map designations of landslide incidence and susceptibility cross formational boundaries. The designations do not correspond so closely in these areas to the units on the geologic map of the United States as they do in most areas west of the Mississippi. Most slope movements in the colluvium consist of slowly moving debris slides although many debris avalanches and debris flows result when persistent steady rain is followed by a sudden heavy downpour. In the Great Valley east of the Appalachian Ridges, broad areas of Cambrian and Ordovician limestone contain pockets of thick residual clay that is moderately susceptible to sliding. This clay forms many small earth flows and slumps, especially along highway cuts. Slumps and earth flows in marine and lacustrine clays along the Hudson River in New York have caused extensive property damage and loss of life. Glacial deposits along the Finger Lakes in central and western New York are moderately susceptible to slumps and earth flows because of undercutting of the deposits by wave action. The granitic and metamorphic rocks of this subdivision are locally unstable. Rockslides and debris avalanches are numerous in the White Mountains of New Hampshire and are not uncommon in the related mountain masses of Maine and in the Adirondacks of New York. In southern New York, rockfalls at Storm King on the Hudson River have caused extensive damage and loss of life. In the Green Mountains of Vermont, hurricane-induced landslides and debris avalanches are not uncommon on the steep slopes. The Pleistocene clay deposits of the upper Hudson River Valley that extend north into the Champlain River Valley are highly susceptible to slumps and earth flows. South of Troy and Albany, N.Y., sliding in these deposits has caused extensive structural damage and the loss of more than 50 lives. Similar deposits lie in the upper Connecticut River Valley. Coastal New England, except for Cape Cod, is a rocky terrain with a highly irregular shoreline. Away from the coast, the land is rolling, and the outcrops are interspersed with ground moraine. Pleistocene marine clay is extensive along lowlands in eastern Maine and New Hampshire. The clay is unstable, and on the steep slopes adjacent to major streams, numerous large areas are susceptible to small slumps and earth flows. Slope failures occur in clays along the Connecticut River in Vermont, Massachusetts, Connecticut, and in clay near Portland, Maine. Numerous small patches of glacial-lake clay in this physiographic subdivision, which are too small to show on the map, generally have low relief, so that slope failures result from excavations rather than natural causes. Along the western Gulf-Atlantic Rolling Plain in Texas and in the disturbed belt along the front of the Stockton-Balcones Escarpment and northward, clay-rich Cretaceous deposits are susceptible to slumping and sliding, even on gentle slopes. Notable among these deposits are the Del Rio Clay, the Taylor and Navarro Groups, and the Eagle Ford Formation. East of the Appalachian Mountains, the country is a dissected rolling plain formed on residual soil from deeply weathered metamorphic rocks. This area is the ”Piedmont” of most usages, which is bordered on the east by a dissected terraced plain on thick deposits of sand, gravel, and clay. Most of the region is free of landslides, but in southern Alabama and eastern Mississippi, slumps and earth flows occur in Cretaceous clay. In Lower Cretaceous clay of Maryland and Virginia, the incidence of slumps and earth flows is high. Northward, in southeastern Pennsylvania and on the north side of Long Island, both landslide incidence and susceptibility are lower, but because of dense residential development, monetary losses have been high. In northeastern New Jersey, large rockfalls occasionally drop from cliffs formed of Triassic diabase and basalt sills. Along Chesapeake Bay, especially the western shore, cliffs of clay, sand, and gravel are moderately susceptible to slumping caused by ground-water sapping and wave erosion. Conditions are similar along Martha’s Vineyard and Nantucket Island in Massachusetts and Sandy Hook in New Jersey. High and rounded hills in the interior of the Carolinas and Georgia are covered with thick residual soil and colluvium overlying igneous and metamorphic rocks. The weathered metamorphic rocks, especially mica schist and mica gneiss, are susceptible to earth flows, slumps, and rockslides. Small slumps and earth flows in deeply weathered metamorphic rocks in Virginia and Maryland are too small and too sparse to be shown on the map. Still farther south, deep loess along the east side of the Mississippi Valley fails by moderate slumping and earth flow along steep riverbanks and roadcuts. West of the Lower Mississippi Alluvial Plain, slides have formed in lower Tertiary deposits, such as the Paleocene rocks of Arkansas and the Cook Mountain Formation of the Eocene Claiborne Group in Texas. These low and dissected plains, which are composed of sand, clay, and limestone, are generally free of landslides, although a few slumps occur along river valleys. The Pleistocene Beaumont Clay fails along dredged waterways on the Texas coast at the Houston ship channel and the Neches River ship channel. The area of the Lower Mississippi Alluvial Plain within the meander belt of the Mississippi River is susceptible to landsliding; practically all slumps and flows are riverbank failures because of erosion by the river and its tributaries. The upper alluvial valley down to about Baton Rouge, La., is more susceptible to failure than the lower delta area because fine-grained deposits in the upper valley are underlain by coarse, easily eroded sand at depths to which the river can scour; this scour causes slumps and earth flows on exposed banks and in deposits below the river level. In the lower delta area, the finegrained deposits are thicker, the river runs wholly within them, and bank failures are much less frequent. Regional variations in climate, geologic structure, lithology, and overburden throughout the United States strongly influence the types of landsliding in each physical subdivision. Although landslide types cannot be shown on a map of this scale, they are briefly mentioned in this paper and are elaborated here in a discussion of four subdivisions: the Colorado Plateau, the Appalachian Highlands, the Coast Ranges of California, and the Southern Rocky Mountains. We have selected these subdivisions because they are among the most slide-prone areas in the United States and show striking contrasts in climate, structure, lithology, and type of slope movement. They are discussed not in geographical order, but in the order in which they can best be contrasted and compared. The Colorado Plateau is a deformed platform where various sedimentary rocks of Precambrian to Tertiary age have been gently warped into broad uplifts, basins, monoclines, and fold belts. Erosion has cut deep canyons and left flat-topped, steep-sided mesas and buttes. Landsliding has been facilitated by the steep topography, by alternating strata of hard and soft rocks, by regional uplift, and particularly by pronounced jointing. Most landslides on the Colorado Plateau are closely related to fracture systems in the rocks. These fracture systems are of three types: regional joint systems that cut major structural features without changing direction, structural joint systems that are related to large individual geologic structures, and stress-release joint systems parallel to such topographic surfaces as cliff faces and canyon walls (Radbruch-Hall, 1977). Fracture-controlled landslides, rock blocks, and rock columns along the edges of steep cliffs are common features of the Colorado Plateau (Robinson, 1970; Ford and others, 1974; Huntoon, 1974). Reiche (1987) described huge backward-tilted landslides of jointed rock at the edges of mesas, which he called ”Toreva-blocks” after the Indian village of Toreva where they are abundant. The larger Toreva-blocks can be as long as 500 m; some of these large blocks may be rotational slumps, but most apparently separate from the mesa along joint planes and then gradually move down and out over the underlying soft material, generally shale. Additional debris that falls from the mesa rim above accumulates behind and on the back of the upper surfaces of the blocks, thereby increasing their weight and pushing them farther down and out. Many of the blocks are tilted back by the added weight of debris, so that they resemble rotational slump blocks. Other blocks remain approximately horizontal or tilt forward as they move slowly downhill along the underlying soft rocks, which are kneaded and distorted as the blocks move over them (fig. 8). Additional blocks break off and move down behind the others, so that a succession of blocks may rim a mesa and extend out into the adjacent valley. The oldest blocks are farthest out and may be partly buried by valley sediment (fig. 4). Toreva-blocks develop where resistant jointed rock caps a canyon wall or mesa and is underlain by softer material. Individual joint blocks or columns 1 m or less across may also move out and away from mesa rims (Robinson, 1970). The outward movement of both large and small blocks may be partly due to the squeezing out of soft underlying material. Arched recesses in vertical cliffs of massive sandstone are striking and characteristic features of the Colorado Plateau landscape. These recesses are caused by the disintegration of vertical rock plates formed by fractures that are parallel to the cliffs and canyon walls. Some fractures forming the plates may be regional (Robinson, 1970), but many of the fractures are due to stress release (fig. 5). Plates parallel to the cliffs may be weakened by lateral stream erosion or by seeps along flat-lying bedding planes. Where lateral erosion or seepage causes undercutting, the lower part of the outermost plate disintegrates and collapses as a rockfall. As this process extends upward and inward, a large recess forms, generally with an arched roof. In places, freestanding vertical rock plates have formed by stream erosion along parallel vertical joints. Where arched recesses form on one side or both sides of a freestanding plate, the recesses may eventually break through to form a freestanding arch or, rarely, a bridge, where a meandering stream has cut through a freestanding plate from both sides and now flows under the resulting arch. To a large extent, these columns, recesses, and natural arches are expressions of mass movement. The separation of joints in sandstone due to the squeezing out of the underlying shale is a gravitational process, and the disintegration of columns and plates causes numerous rockfalls that have contributed materially to rapid erosion of the Colorado Plateau. 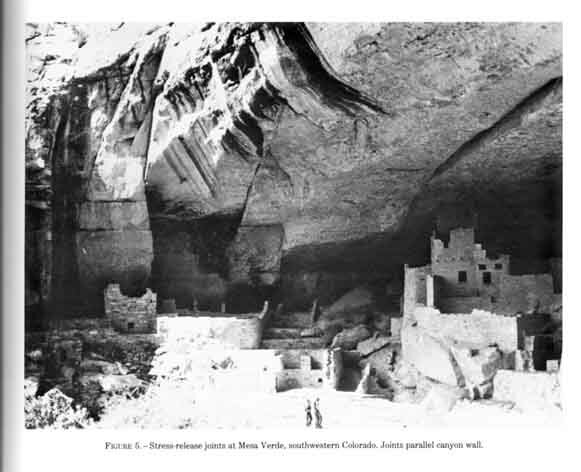 Along with other examples of mass movement, such as Toreva-blocks, the columns, recesses, arches, and rockfalls are related to the regional geologic history, lithology, structure, and jointing characteristic of the entire Colorado Plateau. The northeast-trending Appalachian Highlands of the humid Eastern and Southern United States consist of several areas. The easternmost range of mountains, the Blue Ridge, has relatively strong relief developed on metamorphic rocks. Separated from the Blue Ridge Mountains by the Great Valley are the folded Appalachians, adjoined on the west by the Appalachian Plateau, both overlain by Paleozoic sedimentary rocks. Rocks of the folded Appalachians have been tightly folded and faulted, whereas rocks of the plateau are only slightly deformed. Since completion of deformation at the end of Paleozoic and the beginning of Mesozoic time, erosion has cut steep canyons in both the folded Appalachians and the plateau. The rocks are everywhere deeply weathered. Figure 4. 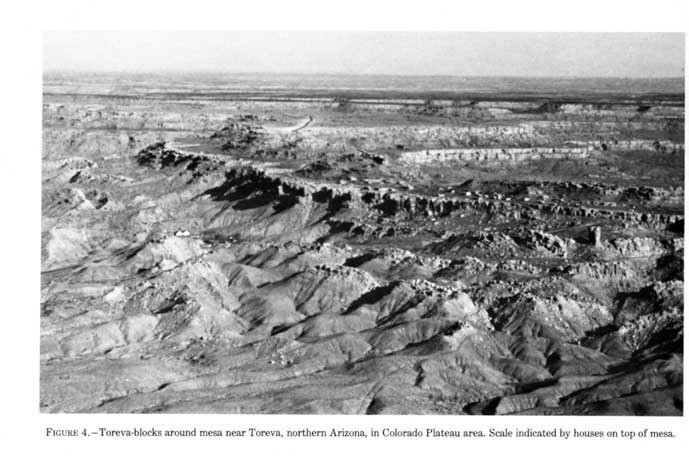 - Toreva-block around mesa near Toreva, northern Arizona, in Colorado Plateau area. Scale indicated by houses on top of mesa. Most landsliding in the Appalachian Highlands differs considerably from that on the Colorado Plateau (fig. 6). Landslides in the highlands are predominantly in weathered bedrock or colluvium, and numerous landslides on the Appalachian Plateau have developed in soils derived from Pennsylvanian and Permian sedimentary rocks. Shale, especially red beds and shale-limestone sequences, disintegrate rapidly into clayey soil upon exposure. Most landslides involving soil and weathered bedrock consist of smooth, integrated, thin earth-flow slabs that may be many square meters in area but generally are less than 2.4 m thick. Commonly, the slabs move no faster than 1 or 2 m per year and are normally underlain by material containing water with a hydrostatic head of as much as 2 m. Damages amount to many millions of dollars per year, but because the flows move slowly, fatalities are few. In both the folded Appalachians and the Blue Ridge Mountains, numerous slow-moving debris slides form in colluvial soil and scree that are particularly abundant on slopes underlain by sandstone and metamorphic rocks. However, the greatest damage and loss of life are caused by debris flows and avalanches when persistent rainfall is followed by a sudden heavy downpour. A single such storm, though often confined to a single small drainage basin, can cause from 100 to more than 1,500 landslides. In 1969, Hurricane Camille caused 1,584 debris flows and avalanches in an area of 98 km’ in the Spring Creek watershed in eastern West Virginia (Schneider, 1978). On the basis of landslide areas observed since 1949 and of storm frequency, geologists of the U.S. Geological Survey estimate that more than 10,000 debris flows and avalanches have occurred in the Appalachians during the 20th century. Although all the colluvium is highly susceptible to slope movement, areal variations in incidence reflect differences in storm intensity and distribution, vegetative cover, void space in the colluvium, and changes by man. Figure 5. - Stress-release joints at Mesa Verde, southwestern Colorado. Joints parallel to canyon wall. Debris avalanches develop only in colluvium that consists predominantly of coarse clastic material with subordinate silt and clay. Such colluvium is derived from thick sandstone and quartzite units. This relation is quite evident on the Appalachian Plateau in Kentucky and Tennessee, where debris avalanches and debris slides are in areas of thick sandstone. Elsewhere on the plateau, where sandstone is not prevalent, debris avalanches and slides are uncommon. Where landsliding involves relatively unweathered bedrock, it resembles sliding on the Colorado Plateau. The alternating hard and soft rocks of the Appalachian Highlands, like similar rocks of the Colorado Plateau, are cut by three types of fracture systems (Radbruch-Hall, 1977): Appalachian regional fractures transecting the general northeast-trending Appalachian fold pattern, structural fractures related to folds, and stress-release fractures parallel to valley walls. The major regional fracture systems in the Appalachian Highlands trend predominantly northwest and northeast; many others trend north-south and east-west (Hobbs, 1904; Lattman and Nickelsen, 1958; Kowalik and Gold, 1976). Joint-controlled blocks are moved by gravity on steep slopes where resistant unweathered rock overlies softer rock. Along the Ohio River near Wheeling, W. Va., calcite-cemented joints in sandstone dip steeply toward the river. In places, the calcite has been leached out, and separate blocks of sandstone have sunk into the underlying shale and moved out toward the river (Baskin, 1972). Disturbance by construction can cause additional movement. 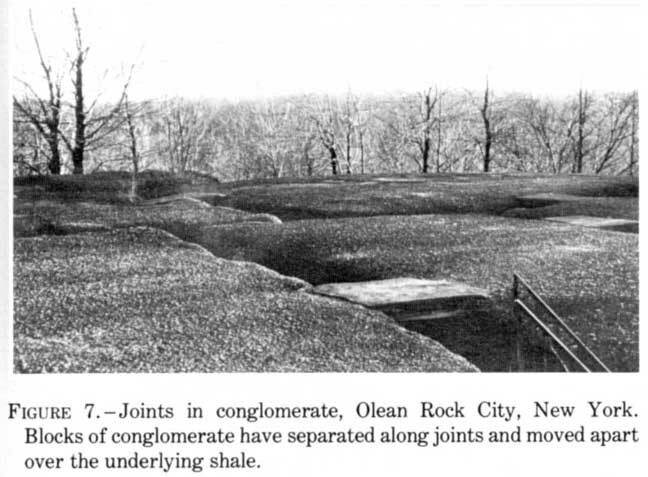 At Olean Rock City in the State of New York, blocks of conglomerate overlying shale are cut by a conjugate joint system into nearly rectangular blocks several meters across (Lobeck, 1927). The separated blocks have moved apart over the underlying shale (fig. 7) to make a ”rock city” consisting of blocks of rock separated by open passageways. The mechanisms of formation and appearance of these blocks are similar to those of jointed blocks around the edges of mesas on the Colorado Plateau. Figure 6. - Earth flows in weathered surface debris, West Virginia. Where stress-release joints parallel a valley, outward gravitational movement of the valley walls has caused anticlines and upward thrusting in the center of the valley (Ferguson, 1967). 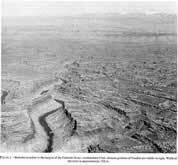 As this outward movement takes place, the compressed rocks in the valley bottom bulge and fracture, commonly along bedding planes (U.S. Army Corps of Engineers, 1978). These valley anticlines are similar to the Meander anticline along the Colorado River in Utah, which was formed by the lateral flow of salt and gypsum (fig. 1). The Coast Ranges of California consist of complex ranges and depressions underlain by a great variety of rocks, including granite, the Franciscan assemblage, Mesozoic rocks other than the Franciscan, Tertiary sedimentary and volcanic rocks, and poorly consolidated Quaternary deposits. The rocks are folded and faulted, and the subdivision is cut by numerous historically active northwest-trending faults, including the San Andreas fault system. The climate ranges from arid at the southeast edge of the ranges to very wet in northern California; rainfall is seasonal. Erosion throughout the province is intense. In northern California, for example, the lower third of the Eel River drainage basin annually discharges 2,700 metric tons of suspended sediment per square kilometer, more than any basin of similar size in the United States (Hawley and Jones, 1969). Landslides contribute a large percentage of the debris eroded from this drainage basin. In the southern semiarid parts of the ranges, erosion is particularly severe during the seasonal winter rains. Figure 7. - Joints in conglomerate, Olean Rock City, New York. Blocks of conglomerate have separated along joints and moved apart over the underlying shale. Figure 8. - Typical landslide topography in the Coast Ranges of northern California. Scale indicated by trees at upper left. Large parts of the Coast Ranges of California are underlain by the spectacularly slide prone rocks of the Franciscan assemblage, which includes mudstone, sandstone, chert, greenstone, serpentinite, and high-grade metamorphic rock. Lithology and physical state (degree of shearing and fracturing) are the primary geologic factors influencing slope stability; landsliding is intense in highly sheared and soft mudstone of the Franciscan melange (Radbruch-Hall, 1976). The physical state of rocks throughout the Coast Ranges is due largely to tectonic deformation. The Franciscan melange consists of chert, greenstone, serpentinite, blueschist, and eclogite, all derived from oceanic crust and upper mantle and set in a matrix of sheared mudstone and minor sandstone. Blake and Jones (1974) suggested that the melange is a tectonic mixture formed by subduction that began during the Early Cretaceous and continued into Tertiary time. In northern California, bands of melange separate several northwest-trending bands of sedimentary Franciscan rocks. In general, the mudstone of the melange matrix is more sheared and, therefore, more subject to landsliding than other units of the Franciscan. Landslides in melange of the Franciscan assemblage consist predominantly of huge masses of slow-moving debris (fig. 8) derived from the underlying bedrock, although in some places the bedrock also is involved. Studies by the California Division of Water Resources (Huffman and others, 1969) showed that these landslides may be as much as 60 m thick, but the landslides are thin relative to their area, which may be several square kilometers (Huffman and others, 1969). Less spectacular, but generally more damaging, are the small hillside debris flows generated by soil slips during rainstorms. These flows are particularly abundant in southern California (fig. 9), where they are a greater danger to residents than all other kinds of slope failure combined. During the period 1962-71, debris flows killed 23 people in the Greater Los Angeles area (Campbell, 1975). 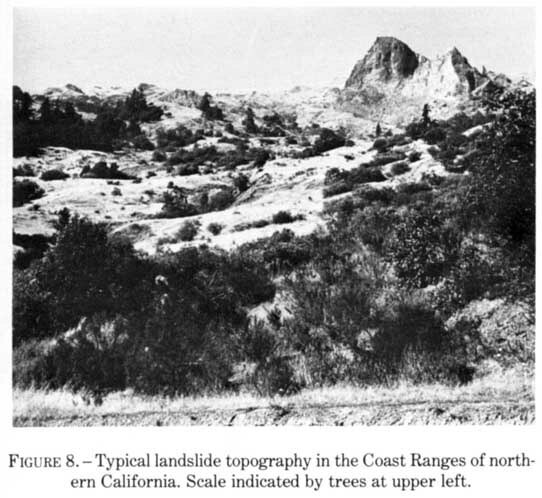 Studies by Campbell (1975) showed that soil slips in southern California require a combination of three conditions: a mantle of colluvial soil or a wedge of colluvial ravine fill, a steep slope, and soil moisture equal to or greater than the liquid limit of the remolded colluvial soil. The soil moisture is almost entirely a result of seasonal rainfall. Because of the long dry season, the soil moisture at the beginning of the rainy season is generally well below field capacity. Once capacity is reached, further increase in the moisture content of the soil requires rates of rainfall high enough to add water faster than it can drain away through the underlying material. For these reasons, soil slips in southern California, like damaging debris flows in the Appalachians, are associated with intense rainfall following previous steady rain, generally when the seasonal total has reached 10 inches. A 10-inch antecedent rainfall seems to bring most of the colluvial soil in southern California to field capacity (Campbell, 1975). Similar small flows are common in poorly consolidated Tertiary rocks in the central part of the State. For example, in the Orinda Formation of the San Francisco Bay area, flows occur in soil on many different types of rocks. Figure 9. 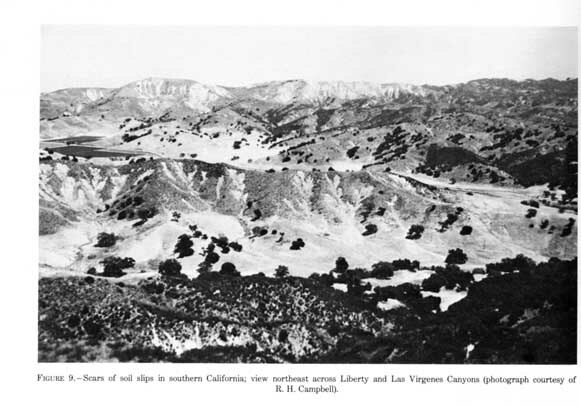 - Scars of soil slips in southern California; view northeast across Liberty and Las Virgenes Canyons (photograph courtesy of R. H. Campbell). Other types of landslides, including slumps and rock falls, occur throughout the Coast Ranges of California in most of the rock types of the range. Many landslides are associated with well-known active faults, such as the San Andreas, because the rocks on the slopes of faultline valleys are commonly highly fractured and sheared. Most of the rocks are thoroughly jointed owing to regional deformation, but there are no obvious regional joint trends. To date, no statistical studies have been done to determine whether regional joint patterns exist in the Coast Ranges which are similar to those on the Colorado Plateau and in the Appalachian Highlands. Because the Southern Rocky Mountains are so varied and complex, slope movement is not only common but also complex. Most rocks of the subdivision have been deformed and fractured by repeated tectonic movements. The climate is semiarid to very wet. At high elevations, the ground may be covered with snow from October through May, and some snow and ice linger in protected places throughout the year. Rockfalls and debris flows are abundant above timberline, where shattered rock, plentiful moisture, steep slopes, and absence of vegetation contribute to their formation. Many basins at high altitudes contain debris from adjacent steep slopes. Because many debris deposits are tongue shaped, contain interstitial ice, and move slowly downslope in the fashion of a glacier, they are commonly referred to as rock glaciers (fig. 10). The many and varied landslides in the San Juan Mountains in the southwestern part of the State of Colorado were early recognized and described by Howe (1909). Grabens on the tops of ridges and associated uphillfacing scarps on ridge sides, both of gravitational origin (sackungen), are numerous in granitic rocks of the high mountains (fig. 11). Similar features form on high buttes and peaks where resistant rocks overlie softer material, such as porphyry or gabbro over shale (fig. 12) (Radbruch-Hall and others, 1976b). Among the more hazardous slope failures in the Southern Rocky Mountains are debris flows generated by heavy rain or snowmelt in areas of broken or altered rock, thick colluvium, or glacial debris. Repeated flows, which commonly build fans where steep tributaries enter larger valleys (fig. 13), have caused much destruction in mountain communities. Weathering is not generally deep in this subdivision, and shallow soil slips in weathered rock or in soil mantle and colluvium are not so much a hazard as in the Appalachians or the Coast Ranges of southern California. Figure 10. - Large rock glacier, Mount Sopris, western Colorado (photograph by John Shelton). Although highly sheared mudstone like that of the Franciscan melange is not common in the Rocky Mountains, areas of sheared and altered rocks associated with volcanic centers are subject to extensive slumping and exceptionally large earth flows (fig. 14). Widespread regional joint patterns have not been recognized in the Rocky Mountains, although recent observations indicate that many landslides in the subdivision, particularly the sackungen, may be controlled by pronounced local joint systems. Until the preparation of the landslide overview map, no comprehensive study of landslide conditions in the United States had been published. The compilation shows that certain types of rocks and certain geologic conditions generally favor landsliding. Fine-grained clastic rocks – those consisting predominantly of silt and clay-size particles – are the most landslide prone and are particularly susceptible if they are poorly consolidated and (or) interbedded with or overlain by more resistant but fractured permeable rocks, such as limestone, sandstone, or basalt. Highly sheared rocks, particularly tectonic melange, slide extensively. Loose slope accumulations of fine-grained surface debris slide throughout the country, particularly at times of intense precipitation. Figure 11. - Graben on crest and trenches (sackungen) on flank of ridge, southwest of Bald Eagle Mountain, Colorado. Among the benefits of a nationwide study of landslides are that the study stimulates comparisons and points out areas that especially need further study; it raises questions about the origin and mechanism of slope movements in various areas with different physical conditions, and promotes additional study leading to better understanding of the causes of slope movements of all kinds. For example, the differences between the predominant types of slope movement on the Colorado Plateau and in the Appalachians were apparent as soon as the landslide overview map was compiled. The similarities between the two areas were not so readily discernible, although the gross similarity between the joint systems in the two areas was previously noted by Nickelsen and Hough (1967). Figure 12. - .North side of Crested Butte, Colorado, showing crest to southwest (right) and gravitational trenches northeast of crest (left from crest). Pronounced break in slope on east side (left) is approximate contact between porphyry and underlying Mancos Shale. Sackungen were first recognized in the Southern Rocky Mountains during the preparation of the landslide overview map, although they had been known previously in other mountainous areas of the world, including Japan (Kobayashi, 1956), Austria (Stini, 1941, 1952; Zischinsky, 1966, 1969), Venezuela (Radbruch-Hall, 1978), New Zealand (Beck, 1968), Czechoslovakia (Nemcok, 1972), and Alaska (Radbruch-Hall, 1978). Sackungen have since been observed in the Cascade Range as well. Figure 13. - Recent debris flow on one edge of a fan constructed by many such flows in the past. Cunningham Gulch, San Juan Mountains, southwestern Colorado (photograph by D. J. Varnes). Figure 14. - Slumgullion earth flow, southwestern Colorado. Source area is in altered volcanic rock. Earth flow dammed Lake Fork of Gunnison River and 700 years ago. Total length of flow is about 6.4 km; upper 3.9 km is still active (photograph by John Shelton). The recognition of regional di6erences and similarities in slope stability is valuable in planning large-scale national programs that involve construction. Areas with excessive slope-stability problems then can be avoided; or, if avoidance is not possible, problems can be anticipated, and the difficulty and cost of remedial measures can be evaluated during the early stages of planning. Bailey, R. G., 1971, Landslide hazards related to land use planning in Teton National Forest, northwest Wyoming: Ogden, Utah, U.S. Department of Agriculture, Forest Service, Intermountain Region, 181 p.
Baskin, Leon, 1972, Block settlement in Grafton Sandstone along the east bank of the Ohio River north of Wheeling, West Virginia: Bulletin of the Association of Engineering Geologists, v. 9, no. 1, p. 17-25. Beck, A. C., 1968, Gravity faulting as a mechanism of topographic adjustment, New Zealand Journal of Geology and Geophysics, v. 11, no. 1, p. 191-199. Blake, M. C., Jr., and Jones, D. L., 1974, Origin of Franciscan melanges in northern California, in Dott, R. H., Jr., and Shauer, R. H., eds., Modern and ancient geosynclinal sedimentation: Society of Economic Paleontologists and Mineralogists Special Publication 19, p. 345-857. Booy, Emmy, 1977, Instability in glacial clays – slope failures in marine and fresh-water deposits, in Engineering Geology and Soils Engineering Symposium, 15th, Pocatello, Idaho, 1977, Proceeding p. 89-55. 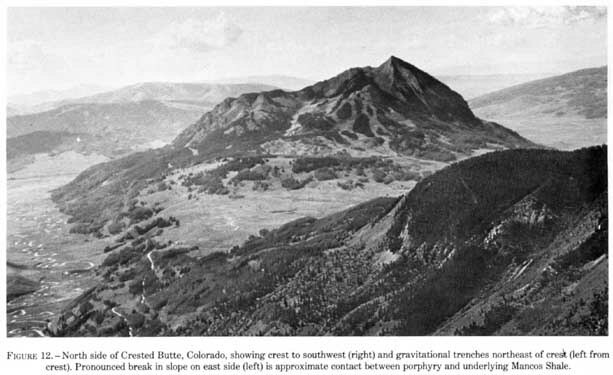 Braddock, W. A., and Either D. L., 1962, Block-glide landslides in the Dakota Group of the Front Range foothills, Colorado: Geological Society of America Bulletin, v. 78, no. 8, p. 817-824. Burchfield B. C., 1966, The Tin Mountain landslide and the origin of megabreccia: Geological Society of America Bulletin, v. 77, no. 1, p. 95-100. Campbell, R. H., 1975, Soil slips, debris flows, and rainstorms in the Santa Monica Mountains and vicinity, southern California: U.S. Geological Survey Professional Paper 851, 51 p.
Cattermole, J. M., 1972, Geologic map of the Rapid City east quadrangle, Pennington County, South Dakota: U.S. Geological Survey Geologic Quadrangle Map GQ – 986, scale 1:24,000. Cleveland, G. B., 1971, Analysis of mudslide risk in southern Ventura County, California – part 2, regional landslide prediction: California Division of Mines and Geology Open-File Report 72 – 23, 88 p.
Colton, R. B., Holligan, J. A., Anderson, L. W., and Patterson, P. E., 1976, Preliminary map of landslide deposits in Colorado: U.S. Geological Survey Miscellaneous Investigations Series Map I-964, scale 1:500,000. Crandell, D. R., 1952, Landslide and rapid-flowing phenomena near Pierre, South Dakota: Economic Geology, v. 47, no. 5, p. 548 – 568. 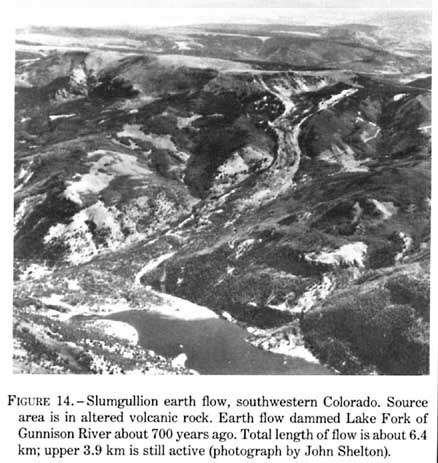 Crandell, D. R., and Varnes, D. J., 1961, Movement of the Slumgullion earthflow near Lake City, Colorado, in Short papers in the geologic and hydrologic sciences: U.S. Geological Survey Professional Paper 424-B, p. B186-B139. 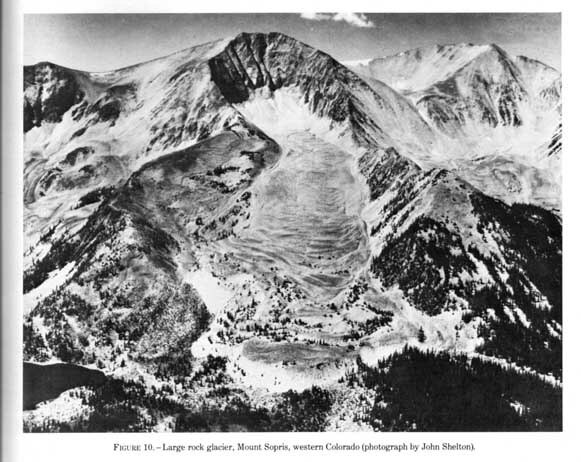 Curry, R. R., 1966, Observation of alpine mudflows in the Tenmile Range, central Colorado: Geological Society of America Bulletin, v. 77, no. 7, p. 771-776. Davies, W. E., 1974, Landslide susceptibility map of the Braddock 7 ½-minute quadrangle, Allegheny County and vicinity, Pennsylvania: U.S. Geological Survey Open-File Report 74-278, 8 p., scale 1:24,000. Day, N. F., and Megahan, W. F., 1975, Landslide occurrence on the Clearwater National Forest [abs. ]: Geological Society of America Abstracts with Programs, v. 7, no. 5, p. 602-608. 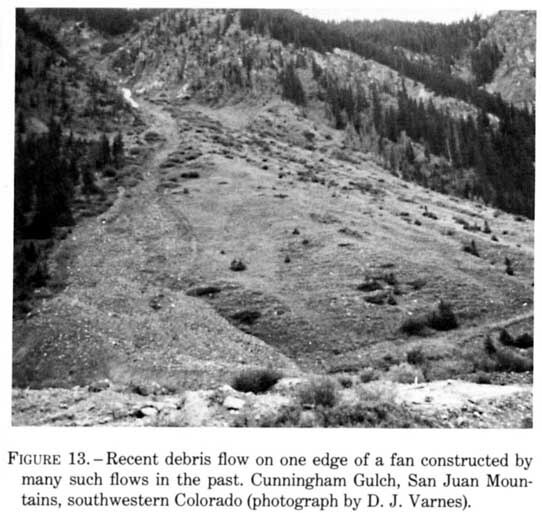 Dupree, H. K., and Taucher, G. J., 1974, Bighorn Reservoir landslides, south-central Montana, in Voight, Barry, and Voight, M. A., eds., Rock mechanics: The American Northwest: University Park, Pa., Pennsylvania State University, College of Earth and Mineral Sciences, Experiment Station, p. 59 – 68. Erskine, C. F., 1978, Landslides in the vicinity of the Fort Randall Reservoir, South Dakota: U.S. Geological Survey Professional Paper 675, 64 p.
Ferguson, H. F., 1967, Valley stress release in the Allegheny Plateau: Engineering Geology, v. 4, no. 1, p. 68-71. Fleming, R. W., Spencer, G. S., and Banks, D. C., 1970, Empirical study of behavior of clay shale slopes: Livermore, Calif., U.S. Army Corps of Engineers, Nuclear Cratering Group Technical Report 15: 2 v.
Ford, T. D., Billingsley, G. J., Jr., Huntoon, P. W., and Breed, W. J., 1974, Rock movement and mass wastage in the Grand Canyon, in Breed, W. J., and Roat, E. C., eds., Geology of the Grand Canyon: Flagstaff, Ariz., Museum of Northern Arizona and Grand Canyon Natural History Association, p. 116-128. Grater, R. K., 1945, Landslide in Zion Canyon, Zion National Park, Utah: Journal of Geology, v. 58, no. 2, p. 116 – 124. Hadley, J. B., 1964, Landslides and related phenomena accompanying the Hebgen Lake earthquake of August 17, 1959, in The Hebgen Lake, Montana, earthquake of August 17, 1959: U.S. Geological Survey Professional Paper 485, p. 107-188. Hammond, E. H., 1965 , Physical subdivisions [of the United States], in The National Atlas of the United States of America: Washington, D.C., U.S. Department of the Interior, Geological Survey, p. 61, scale 1:17,000,000. Hansen, W. R., 1965, Geology of the Flaming Gorge area, Utah- Colorado-Wyoming: U.S. Geological Survey Professional Paper 490, 196 p.
Hawley, N. L., and Jones, B. L., 1969, Sediment yield of coastal basins in Northern California: U.S. Geological Survey open-file report, 19 p.
Hobbs, W. H., 1904, Lineaments of the Atlantic border region: Geological Society of America Bulletin, v. 15, p. 488 – 506. Holland, T. W., and Everitt, M. C., 1974, The Shell Canyon landslides: A geological engineering case history, in Voight, Barry, and Voight, M. A., eds., Rock mechanics: The American Northwest: University Park, Pa., Pennsylvania State University, College of Earth and Mineral Sciences, Experiment Station, p. 87-44. Howe, Ernest, 1909, Landslides in the San Juan Mountains, Colorado, including a consideration of their causes and their classification: U.S. Geological Survey Professional Paper 67, 58 p.
Huffman, M. E., Scott, R. G., and Lorens, P. J., 1969, Geologic investigation of landslides along the Middle Fork Eel River, California [abs]: Geological Society of America Abstracts with Programs, v. 1, no. 7, p. 111-112. Huntoon, P. W., 1974, The post-Paleozoic structural geology of the eastern Grand Canyon, Arizona, in Breed, W. J., and Roat, E. C., eds., Geology of the Grand Canyon: Flagstaff, Ariz., Museum of Northern Arizona and Grand Canyon Natural History Association, p. 82-115. Jones, F. 0., Embody, D. R., and Peterson, W. L., 1961, Landslides along the Columbia River Valley, northeastern Washington, with a section on Seismic surveys, by R. M. Hazlewood: U.S. Geological Survey Professional Paper 867, 98 p.
Keefer, W. R., and Love, J. D., 1956, Landslides along the Gros Ventre River, Teton County, Wyoming, in Wyoming Geological Association Annual Field Conference, 11th, 1956, Guidebook, p. 24-28.
b 1974, Geologic map of the United States (exclusive of Alaska and Hawaii): Reston, Va., U.S. Geological Survey, scale 1:2,500,000, 2 sheets. Kobayashi, K., 1956, Periglacial morphology in Japan: Builetyn Perglacjalny, v. 4, p. 15 – 86 (Lodzkie towarzystwo naukowe societas scientarium lodziensis, Wydzial III, sectio III). Kowalik, W. S., and Gold, D. P., 1976, The use of LANDSAT-1 imagery in mapping lineaments in Pennsylvania, in Hodgson, R. A., Gay, S. P., and Benjamins, J. Y., eds., International Con- ference on the New Basement Tectonics, 1st, Salt Lake City, Utah, Proceedings: Utah Geological Association Publication 5, p. 286-249. Lattman, L. H., and Nickelsen, R. P., 1958, Photogeologic fracture- trace mapping in Appalachian Plateau: American Association of Petroleum Geologists Bulletin, v. 42, no. 9, p. 2288-2245. Lemke, R. W., 1960, Geology of the Souris River area, North Dakota: U.S. Geological Survey Professional Paper 825, 188 p.
Lemke, R. W., and Maughan, E. K., 1977, Engineering geology of the city of Great Falls and vicinity, Montana: U.S. Geological Survey Miscellaneous Investigations Series Map I-1025, scale 1:24,000. Leonard, B. F., 1978, Thunder Mountain district, in Cater, F. W., Pinckney, D. M., Hamilton, W. B., Parker, R. L., Weldin, R. D., Close, T. J., and Zilka, N. T., Mineral resources of the Idaho primitive area and vicinity, Idaho: U.S. Geological Survey Bulletin 1804, p. 45-52, 72. Lewis, R. Q., and Campbell, R. H., 1965, Geology and uranium deposits of Elk Ridge and vicinity, San Juan County, Utah: U.S. Geological Survey Professional Paper 474-B, p. Bl-B69. Lobeck, A. K., 1927, A popular guide to the geology and physiography of Allegheny State Park: New York State Museum Handbook 1, 288 p.
Love, J. D., 1978, Map showing differences in the stability of the ground, Jackson quadrangle, Teton County, Wyoming, U.S. Geological Survey Miscellaneous Investigations Series Map I – 769 – F, scale 1:24,000. Malde, H. E., Powers, H. A., and Marshall, C. H., 1968, Recon- naissance geologic map of west-central Snake River Plain, Idaho: U.S. Geological Survey Miscellaneous Geologic Investigations Map I-878, scale 1:125,000. Mead, W. E., 1972, Soil and rock failure in the Wasatch Front, in Environmental geology of the Wasatch Front, 1971: Utah Geological Association Publication 1, p. Ll – L8. Missouri Mineral News, 1972, A rare moment: The bluff collapse on the Gasconade: Missouri Mineral News, v. 12, no. 6, p. 108-106. Mudge, M. R., 1965, Rockfall-avalanche and rockslide-avalanche deposits at Sawtooth Ridge, Montana: Geological Society of America Bulletin, v. 76, no. 9, p. 1003 – 1014. 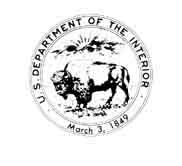 National Oceanic and Atmospheric Administration, 1974, Climates of the States: Port Washington, N.Y., Water Information Center, Inc., 2 v.
Nemcok, A., 1972, Gravitational slope deformation in high mountains: International Geological Congress, 24th, Montreal, Canada, 1972, Section 18, Proceedings, p. 182 – 141. 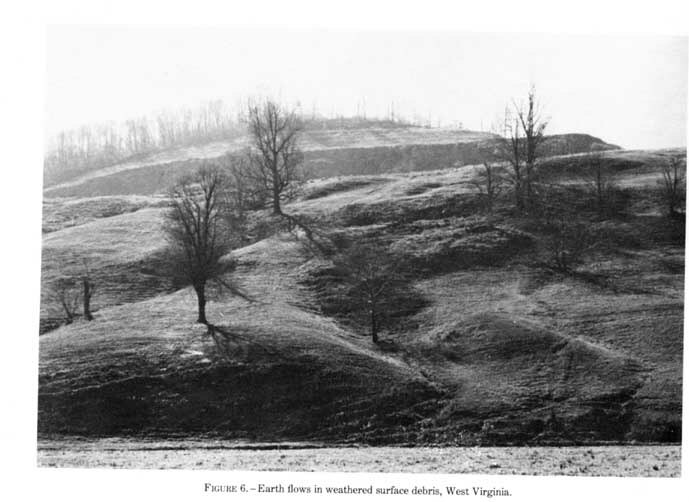 Nickelsen, R. P., and Hough, V. D., 1967, Jointing in the Appalachian Plateau of Pennsylvania: Geological Society of America Bulletin, v. 78, no. 5, p. 609-680. Nilsen, T. H., and Brabb, E. E., 1972, Preliminary photointerpretation and damage maps of landslide and other surficial deposits in northeastern San Jose, Santa Clara County, California: U.S. Geological Survey Miscellaneous Field Studies Map MF – 861, scale 1:24,000. Pashley, E. F., Jr., and Wiggins, R. A., 1972, Landslides of the northern Wasatch Front, in Environmental geology of the Wasatch Front, 1971: Utah Geological Association Publication 1, p. K1 – K16. 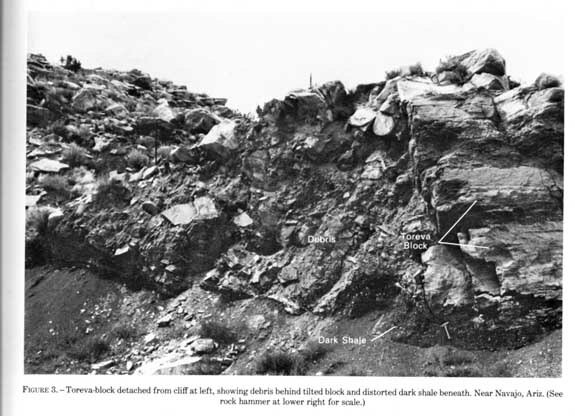 Pierce, W. G., 1968, The Carter Mountain landslide area, northwest Wyoming: in Geological Survey research 1968: U.S. Geological Survey Professional Paper 600 – D, p. D285 – D241. Radbruch, D. H., and Crowther, K. C., 1978, Map showing areas of estimated relative amounts of landslides in California: U.S. Geological Survey Miscellaneous Geologic Investigations Map I-747, scale 1:1,000,000. Radbruch-Hall, D. H., 1976, Map showing areal slope stability in part of the northern Coast Ranges, California: U.S. Geological Survey Miscellaneous Investigations Series Map I – 982, scale 1:62,500. – 1977, The systematic evaluation of landslide incidence and susceptibility in the United States: International Association of Engineering Geology Bulletin 16, p. 82 – 86. – 1978, Large-scale gravitational creep of rock masses on slopes, in Voight, Barry, ed., Rockslides and avalanches: Natural phenomena: Amsterdam, Elsevier, 1, p. 607-657. Radbruch-Hall, R. H., Colton, R. B., Davis, W. E., Skipp, B. A., Lucchitta, Ivo, and Varnes, D. J., 1976a, Preliminary landslide overview map of the conterminous United States: U.S. Geological Survey Miscellaneous Field Studies Map MF-771, scale 1:7,500,000. 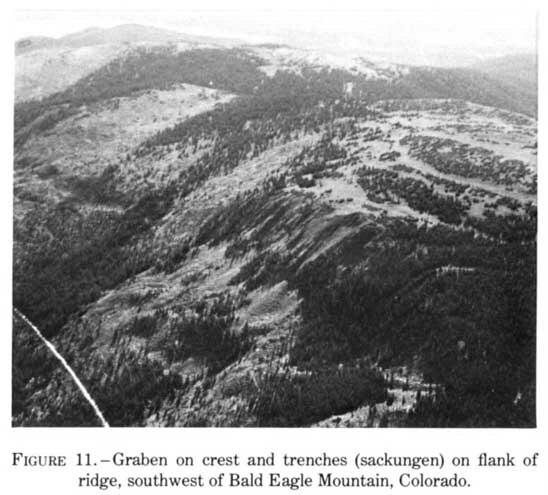 Radbrush-Hall, D. H., Varnes, D. J., and Savage, W. Z., 1976b, Gravitational spreading of steep-sided ridges (”sackungen”) in western United States: International Association of Engineering Geology Bulletin 14, p. 28 – 85. Reiche, P., 1987, The Toreva-block, a distinctive landslide type: Journal of Geology, v. 45, no. 5, p. 588 – 548. Robinson, C. S., Mapel, W. J., and Bergendahl, M. H., 1964, Stratigraphy and structure of the northern and western flanks of the Black Hills uplift, Wyoming, Montana, and South Dakota: U.S. Geological Survey Professional Paper 404, 184 p.
Rogers, W. P., and Rold, J. W., 1972, Engineering geologic factors of the Marble area, Gunnison County, Colorado: Denver, Colorado Geological Survey, 44 p.
Schneider, R. H., 1978, Debris slides and related flood damage resulting from Hurricane Camille, 19-20 August, and subsequent storm, 5-6 September, 1969, in the Spring Creek drainage basin, Greenbriar County, West Virginia: Knoxville, University of Tennessee, Ph.D. thesis, 247 p.
Schuster, R. L., and Krizek, R. J., eds., 1978, Landslides: Analysis and control: Washington, D.C., National Research Council, Transportation Research Board Special Report 176, 284 p.
Scully, John, 1978, Landslides in the Pierre Shale in central South Dakota: Pierre, South Dakota Department of Highways State Study 685 (67), 707 p.
Sharp, W. N., and Cavender, W. S., 1962, Geology and thorium- bearing deposits of the Lemhi Pass area, Lemhi County, Idaho, and Beaverhead County, Montana: U.S. Geological Survey Bulletin 1126, 76 p.
Shreve, R. L., 1968, The Blackhawk landslide: Geological Society of America Special Paper 108, 47 p.
Shroder, J. F., 1971, Landslides of Utah: Utah Geological and Mineralogical Survey Bulletin 90, 51 p.
Stini, Josef, 1941, Unsere Taler wachsen zu: Geologie und Bauwesen, v. 18, no. 8, p. 71-79. – 1952, Neuere Ansichten iiber ”Bodenbewegungen” iiber Beherr- schung durch den Ingenieur: Geologie und Bauwesen, v. 18, no. 1, p. 81-54. U.S. Army Corps of Engineers, 1978, Interim report on foundation treatment – Laurel Dam: Nashville, Tenn., U.S. Army Engineer District, 18 p.
Van Horn, Richard, 1975, Largest known landslide of its type in the United States – a failure by lateral spreading in Davis County, Utah: Utah Geology, v. 2, no. 1, p. 88-88. 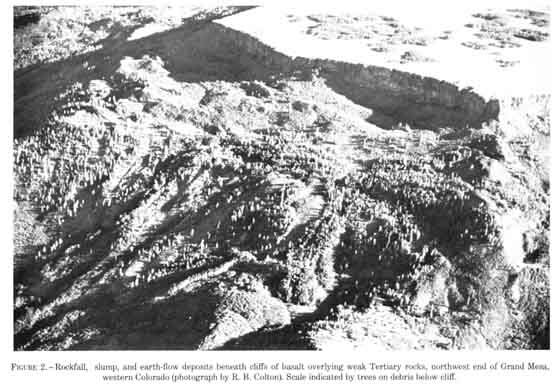 Van Horn, Richard, Baer, J. L., and Pashley, E. F., Jr., 1972, Landslides along the Wasatch Front, Utah, in Environmental geology of the Wasatch Front, 1971: Utah Geological Association Publication 1, p. Jl – J16. Varnes, H. D., 1949, Landslide problems of southwestern Colorado: U.S. Geological Survey Circular 81, 18 p.
Voight, Barry, 1978, Lower Gros Ventre slide, Wyoming, U.S.A., in Voight, Barry, ed., Rockslides and avalanches, 1: Natural phenomena: Amsterdam, Elsevier, p. 118-166. Waldrop, H. A., and Hyden, H. J., 1968, Landslides near Gardiner, Montana, in Short papers in geology, hydrology, and topography: U.S. Geological Survey Professional Paper 450 – E, p. Ell-E14. Wilson, Lee, 1967, Climatic classification, in Fairbridge, R. W., ed., The encyclopedia of atmospheric sciences and astrogeology: New York, Reinhold, p. 171-198. Yeend, W. E., 1978, Slow sliding slumps, Grand Mesa, Colorado: Mountain Geologist, v. 10, no. 1, p. 25 – 28. Zischinsky, Ulf, 1966, On the deformation of high slopes: International Society of Rock Mechanics Congress, 1st, Lisbon, Portugal, 1966 Proceedings, v. 2, p. 179 – 185. – 1969, Uber Sackungen [About subsidences]: Rock Mechanics, v. 1, no. 1, p. 80-52.